I started with two coats of Purple Rain. It's part of the Pure Ice Diamond Couture Collection. I originally thought these were all chunky glitters but I guess not. 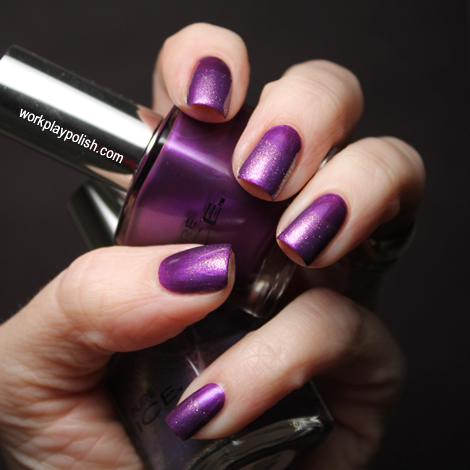 Purple Rain is a bright royal purple with a metallic finish. Application was a breeze. As a matter of fact, the formula reminds me of A-England Perceval...creamy and easy to polish. I loooove me some A-England so that's an enormous compliment. After two coats of Purple Rain, one coat of Seche Vite, and ten minutes dry time, I applied hole reinforcers to each nail and polished one coat of Pure Ice Busted. Busted has been out for some time so I don't know much about it. I've been so impressed with the Runway Trends polishes, that I moseyed over to the Pure Ice permanent display and picked this one up too. Busted is a super sheer, lilac microglitter. It's so sheer, in fact, I can't imagine how many coats it would take to build to opacity...maybe a dozen or more? I polished Busted on each nail and immediately removed the hole reinforcer. The result is a super-duper subtle half moon mani. In person, it's a touch more obvious as the light hits a moving target. But still...very subtle and very pretty.